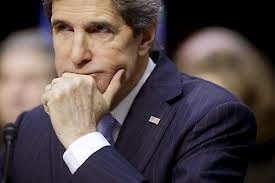 Bluegrass Pundit: Secretary of State John Kerry asks if global warming is fake, "what’s the worst that can happen?" Secretary of State John Kerry asks if global warming is fake, "what’s the worst that can happen?" The world could waste billions trillions of dollars and damage economic growth based on a fraud? If we make the necessary efforts to address this challenge – and supposing I’m wrong or scientists are wrong, 97 percent of them all wrong – supposing they are, what’s the worst that can happen? We put millions of people to work transitioning our energy, creating new and renewable and alternative; we make life healthier because we have less particulates in the air and cleaner air and more health; we give ourselves greater security through greater energy independence – that’s the downside. This is not a matter of politics or partisanship; it’s a matter of science and stewardship. And it’s not a matter of capacity; it’s a matter of willpower.